I’ve been hearing for years about the wonders of Scrivener. In fact, I’ve had it on my computer since 2010. And I’d tried it...a couple of times. With no real success. It was just kind of...meh. But I kept hearing all these other writers extolling its virtues, telling me how much they loved it and couldn’t live without it. How it had “changed the way they write.” Finally, in April, Kelley Armstrong (whom I both admire and adore!) told me to take the plunge and start using it, because all those other authors, they were right. And she made a recommendation—she told me to get a book called Scrivener for Dummies by Gwen Hernandez to help me muddle through the stuff I just wasn’t “getting” about the program. And guess what? 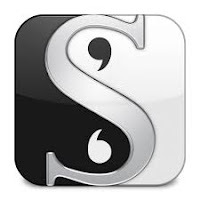 I sort of get it, the whole Scrivener thing. Not just because of the book, but I did some research, too. I watched videos and tutorials. I learned what the program could do for me. And here’s the thing, it’s takes everything I love and puts it all in one place. It’s like having Pinterest and all my research and my clunky character profiles and my outlines and my little sticky notes (that are usually jumbled all over my desk) with any random thought that pops into my head AND MY MANUSCRIPT all formatted into one ginormous electronic file...where I can find any of the info whenever I need it. It’s revolutionary. First of all, there’s a free 30-day trial over at Literature & Latte (the site that designs and sells the program). This way you can try Scrivener with zero risk! One of the things I like about the program, too, is that I work on two separate Macs, and even though I bought the program WAY BACK in 2010, I was able to not only upgrade the program I bought to the most current version for free, but I was also able to use THAT SAME license for my second Mac at no additional cost. AWESOME!!! I haven’t gone through them all, but here are some more links to tutorials. Third, if you need a book to refer to, definitely pick up Scrivener for Dummies by Gwen Hernandez. This is a great guide for beginners! All-in-all, I’m loving Scrivener so far! Life changing? Well, we’ll see about that, but I honestly can’t thank Kelley enough for pushing me to make the switch!! What about you guys, any Scrivener thoughts??? I took Gwen's online course and fell in love with Scrivener!! I didn't realize she HAD an online course, but that's awesome--I'll have to check it out! Thanks Lee! I was TERRIFIED to try it. It was so confusing, so I thought. And what if I accidentally pushed a button and lost everything? But I am so happy I did. I've also likened it to Pinterest before. And when I got a Mac, I had just shelled out all that money so I thought I'd wait to get the Mac version. That's when I seriously realized that I couldn't LIVE without it. I couldn't go back. I love the fact that I can pull up any chapter or note for reference without taking valuable writing time. It's all right there! That's the part I couldn't go back from. I haven't used daily targets yet, but I love the idea of that--it's definitely something I'll be trying, Leigh!